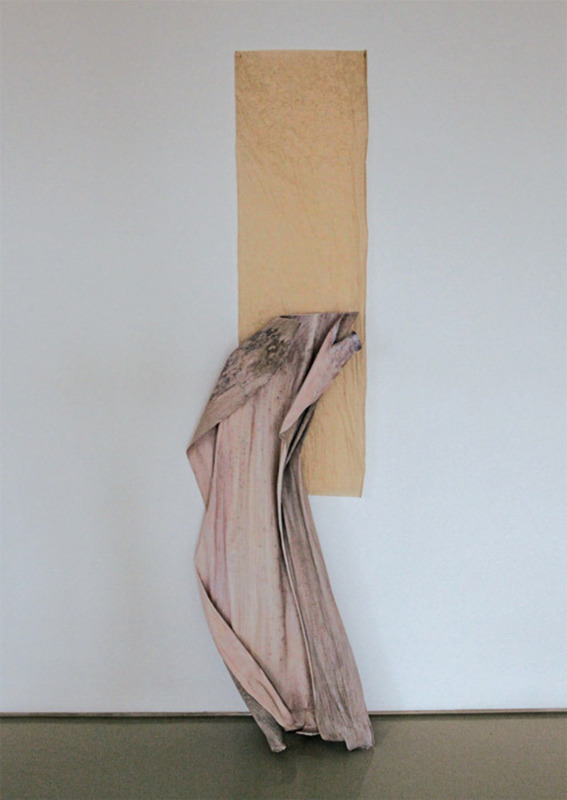 Gyan Panchal, wedhneumi, 2012, palm tree bark, paint, paper, 80 x 19 5/8 x 9 1/2". There are circumstances when sticks and stones may break our bones, as the saying goes. Paris-based Gyan Panchal’s show in Mumbai was not one of them. Here, such sturdy materials appeared curiously fragile. In bndus (all works 2012), the aforementioned “sticks”actually three white-painted bamboo poleswere perched rather forlornly near a window. In wedhneumi, the bark of a palm tree emerged from a piece of yellowish paper on a wall, its shell-pink contours recalling the ruffled skirts of a soiled petticoat. Panchal’s curious titles, by the way, are gleaned from his study of the Proto-Indo-European language reconstructed by linguists to aid their research into the roots of Asian and European dialects. Since the terms have no currency in everyday life and no fixed pronunciation, he sees them as occupying the same marginal zone as his artworks.